Just like many other religions, the Wiccan faith has many sects or denominations. There are dozens of different types of Wiccans, Pagans & Neo-Pagans. Sometimes, the differences between these groups are small. Sometimes, the differences are enormous. This page is a brief understanding of Paganism, Wicca and the Celtic Wicca we practice at Life Temple & Seminary in North Carolina. Life Temple & Seminary is a traditional Celtic Temple. This means we value and honor the pagan practices of the Celtic Clans. We study the life, times and mythology of the ancient Celts. We strive to understand how they lived & worshiped. Our Sabbat names are Celtic or Gaelic in origin. 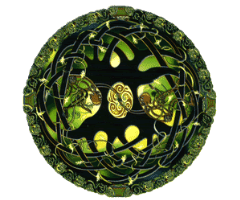 The Celtic pathway is the origin of many of the beliefs and reasons for our faith. If you are considering our Temple as a place for your own spiritual growth, we would like to clarify a few things. First, the Celtic path is not simply limited to the geographical area we now know as the UK & Ireland. The Celtic Empire was massive and at one point (prior to the Roman Empire) dominated most of Europe. We attract many people who identify with ancestral roots in Ireland, Scotland, England, & Wales; however the Celtic path could just as easily be called the European path as those with Mediterranean, Roman, Slavic & Germanic roots find a spiritual home with us. An interest in Celtic heritage & genealogy is wonderful, but not necessary in order to be of the Wiccan faith. You do not need to be of Irish or Scottish decent to worship with us or take our classes. At Life Temple we (as a group) agree to come together and practice a standardized form of Wicca. This means that when you attend one of our rituals you will find a consistent form of worship. All those participating in or officiating our rituals are 'on the same page'. This results in an environment free of politics, free of conflict, and free of the confusion that takes place at less structured, more eclectic groups. Throughout the years our members and students have come from all backgrounds, races, and cultural origins. All these individuals have their own personal beliefs and practices. However when we come together at Life Temple we follow a common, well-defined tradition. This enables us to focus on spiritual growth & that which we have in common. It also ensures that we leave our baggage, as well as anything that may divide us, at the Temple doors. A Pagan religion is simply defined as a religion of non-Judeo-Christian origin, thus MANY religions are defined as Pagan. Traditional Pagan religions are those that pre-date Christianity. Shamanism is one such example, but there are countless others. These religions often practice very ancient forms of worship. These groups can be difficult to find & are not widely publicized. Usually, you must do a lot of research & self-study in order to identify a Pagan group that matches your beliefs. Neo-Pagans are new or modern sects of Paganism. Usually these groups are less than 100 years old, many having been founded in the 1960's along with feminism, anti-war / peace & love movements. Neo-pagans are free-thinkers. Many of these groups are more a community or social gathering than a spiritual tradition. They often come together to socialize with tolerant or like-minded individuals. Individuality is encouraged, while conformity or strict organization is often frowned upon. Neo-pagan groups practice a general concept of spirituality & harmony. All Wiccans are Pagans but not all Pagans are Wiccans. Some Wiccan traditions are associated with the founder or creator of their path. Such is the case with Gardenerian & Alexanderian Witchcraft. Groups that practice these traditions follow the teachings, beliefs & practices of the figure-head or founder. These groups have various cultural origins & in many cases do not have a specific history or anthropology. Instead their founders have chosen to borrow 'bits & pieces' from various cultures & myths. This is not uncommon & does not invalidate or devalue these paths. Many of these churches and covens are known as Eclectic. Some Wiccan traditions are associated with a culture. Examples are Celtic Wiccan, Strega, Norse, Welsh, Dianic & Egyptian. These paths are rooted in the society or culture they are named for. These groups follow & teach the history, mythology, anthropology, & archeology of the culture they are named after. In some cases, like at Life Temple, the Temple (via it's founders) can actually trace its roots back to that same culture. Witchcraft doesn't necessarily have anything to do with Wicca. Witchcraft is the study & practice of magical arts. Wicca is a religion. While most Pagans & Wiccans believe that magic exists, it is not necessarily something that each group or individual dabbles in. It is also helpful to note that many non-pagan religions have magical practices and practitioners. A Witch can be Jewish, Christian, Hindu etc. However it is rare that these free-thinkers will refer to themselves as such. The use of magic is a very personal thing. And most magicians have their own independent needs or reasons to resort to spells and the like. Please do not confuse Witchcraft with Wicca. We do not teach magic at Life Temple & Seminary.